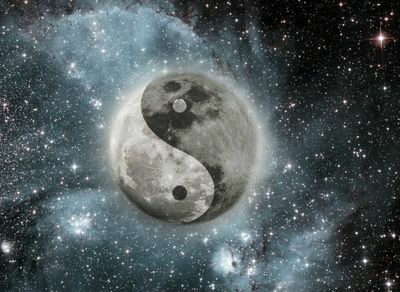 There’s a harmony, a balance, in the Universe. Light needs dark. Dark needs light. If you blow one of them up, then, I mean— [...] It’d be really not a good thing. Like ‘end of reality’ not good. According to God, there has always been a Cosmic Balance in the Universe, one where light needs darkness and vice versa, and if one of them is removed from the scales, then everything will cease to exist. The Embodiment of Light is God and the Embodiment of Darkness is Amara. When God and the archangels defeated the Darkness, God decided to lock her away to maintain the Cosmic Balance rather than killing her, thus allowing Creation to happen. To imprison the Darkness, God created a Mark to act as the lock and key of her cage. When the Darkness was released, Amara planned to make God suffer by destroying everything He created, prompting Chuck to "come off the sidelines" to help the Winchesters stop her from reducing all of Creation to ash. After the attack on Amara succeeds, with her ceding defeat and prepared to die, she uses her remaining energy to attack God, severely and terminally weakening Him. Amara reveals to Dean that the Sun is "dying" because God is dying. Since God is dying, the scales are tipping away from Light and into nothing. After that, everything will cease to exist, including her. Dean convinces her to put aside her anger and hatred and ask herself what she wants. She summons God and they reconcile after Amara tells God that all she wants is for them to be a family again and Chuck reveals that he wants that as well. Amara heals God, restoring the Sun in the process, and they both depart to have a "family meeting." Thus the Cosmic Balance is no longer in jeopardy. After God and Lucifer reconcile, they explain to Sam and Dean the concept of the Cosmic Balance. They agree to imprison Amara once again to maintain it. Sam, Dean, God, and Lucifer, along with Crowley, Rowena, Clea and her fellow witches, the angels, and the demons, launch an attack on Amara to weaken her long enough for God to restore the Mark of Cain and transfer it onto Sam. However, not wanting to be imprisoned again, Amara attacks God and interrupts the transfer. Lucifer tries to stop her, but Amara tears him out of Castiel and attacks God with black tendrils of pure darkness. Amara states that God is not dead, but is starting to fade away, but not before He watches all of Creation transform into nothing. In the aftermath of the massive attack on the Darkness, they all witness the Sun fading away. Castiel remarks that the Sun is the source of all life on Earth and without it, everything will waste away. They all agree that since imprisoning her will no longer help prevent the Sun from dying, they must kill the Darkness. God reveals to them that Amara's only weakness is light. As He puts it, the amount of light necessary to destroy her would be "ten thousand suns set to supernova." Castiel states that souls are full of energy and light, each equivalent to one hundred suns. Rowena agrees to help them build a bomb made out of the souls they can manage to collect. Castiel goes to Heaven to ask for souls, but the angels refuse to help because they know that God is dying and they are "dying with dignity." Crowley had souls saved up, but the demons raided his stash after Lucifer reclaimed the throne and left him nothing to contribute. Sam and Dean go to Waverly Hills Sanatorium to collect the souls of vengeful spirits residing within the abandoned hospital using a crystal forged by a spell Rowena read from the Book of the Damned. The reaper, Billie, spots them there and agrees to give them what they need to complete the bomb by raiding the Veil and supplying them with a couple hundred thousand souls. Rowena transfers the energy onto Dean and told him that touching his fingers together will set off the bomb. After visiting the grave of Mary Winchester, God transports Dean to Amara's location. Amara is able to sense the energy resonating within Dean and blows his cover. After exchanging words with Dean, Amara is convinced to talk to her brother. She summons God to her side and they talk. Amara forgives God and decides to allow Creation to prosper and restores God and the Sun. They both depart, but not before God removes the bomb from Dean and Amara revives Mary Winchester as a thanks for Dean giving her what she needed the most. The concept of Yin and Yang depicts the balance between Darkness and Light. This page was last edited on 30 December 2018, at 03:02.